You've got a friend to lean on with this chair. 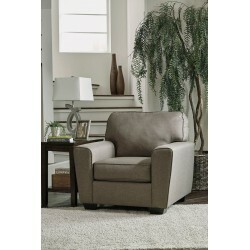 Covered in sleek, cream-colored woven upholstery, it has a relaxed contemporary vibe. Sit back and lean into wide tapered arms. Neutral color sets the scene for seasonal home decor. If style is the question, then this chair is the answer. Clean-lined profile is beautifully contemporary. Upholstered in a plush chenille, it's pleasing to the touch. Plump cushioning makes it even better to sit on for as long as you desire. Slate gray hue works with a variety of decor. Inspired by high style menswear, this chair is your one-stop-shop seat. Contemporary and farmhouse aesthetic merge with black nickel nailhead trim, the fog shade and classy button tufting. 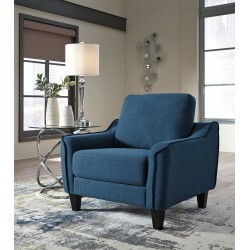 Plush upholstery is rich with character and texture to provide at-the-ready comfort day or night. May the freshness of spring pastels linger in your home year-round with this chair. 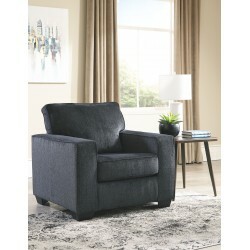 Transitional style with sloping track arms and tufted back cushion speaks to relaxed sensibility. Pillow in light olive green, sky blue and creamy gray tones sits beautifully against soft velvet upholstery. Hint of sheen elevates your room. Transitional. Pristine. Chic. This chair is to die for. Upholstered in a light charcoal colored chenille with a velvet soft hand. 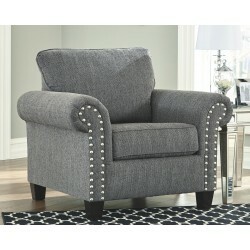 Roll arms are highlighted with chrome-tone nailheads. Renew your love of blue with this casually cool chair. Its textured indigo-hue upholstery is a welcome sighting in a sea of beige. Track arms enhance the clean, crisp aesthetic that simply works. Talk about fine lines and great curves. That's the beauty of this standout chair made to suit your appreciation for simplicity and love of contemporary style. A striking flared frame, comfy pillow top armrests and an ultra-soft upholstery that holds up to everyday living complete this fashion statement.